Sit down with Kirk Cousins, record-setting Michigan State University quarterback and 2012 draft pick of the NFL’s Washington Redskins. 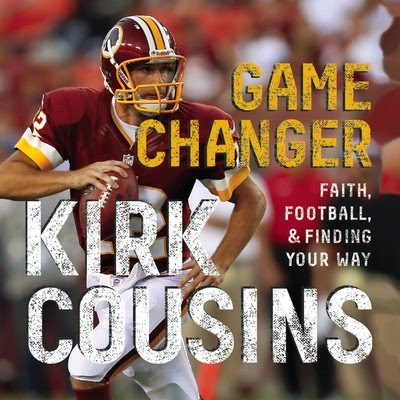 In Game Changer, Cousins gives readers an inside look at his life—as experienced under the bright lights of college and professional football—and how he puts his faith and values into action, both on and off the field. My oldest son is a huge Kirk Cousins fan so when I saw this book, I got it more for him than I did for myself. We were blessed to actually attend Kirk's last game at MSU. It's something that Ben still talks about. He hasn't had a chance yet to read this book, but I know it's going to be his first choice as soon as he finishes his current summer reading book and even though he has some learning difficulties, I know he's going to devour it. Kirk writes in an easy to follow style and does more than talk about football (though there's a lot of that too!). He talks about his journey and how his faith has helped him. While he says he doesn't want to push the religious aspect too much, he does talk about it a lot, so don't say you haven't been warned. Overall, a great, easy read and one that I think many will enjoy.